Assistant Director for Outreach of West Virginia University’s Injury Control Research Center, Herb Linn passed a take-home naloxone kit around the room. 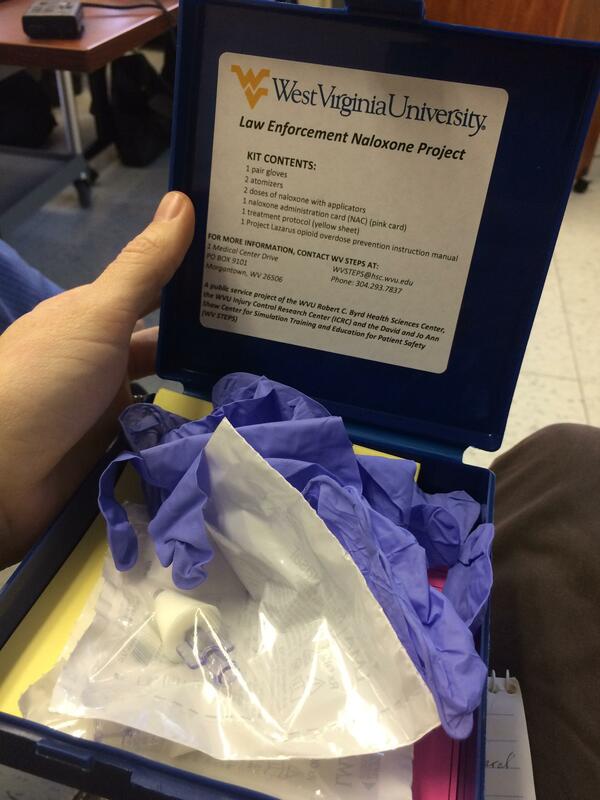 The kit includes instructions, gloves and Naloxone to be administered as a nasal spray. Linn said the value of each kit is about $11. The drug Naloxone can stop a heroin or pain pill overdose in its tracks. It’s been used by doctors and emergency workers for a while. Now it’s a tool for law enforcement members of the public, too. In some places, after completing training, non-professionals are receiving kits or prescriptions for the drug. Herb Linn is the Assistant Director for Outreach of West Virginia University’s Injury Control Research Center. He spoke to more than 20 community members: medical professionals, school administrators, and rehab specialists. Linn pointed to the Eastern Panhandle, where he says trained individuals were able to administer naloxone saving three overdosing people. One, he says, was pregnant. He talked about research his organization has conducted into other opioid overdose prevention programs initiated in urban areas of the country in the 90s. Programs that would provide users with naloxone. Linn also conducted interviews with opioid users in Logan, Mingo, and Boone counties and discovered about 90 percent would be willing to participate in similar programs. Those programs provide both naloxone and training to identify an overdose and administer the drug. A federal grant will make a lifesaving drug available to State Troopers in three southern West Virginia counties. U.S. Attorney for the Southern District of West Virginia Booth Goodwin announced the $100,000 grant in Princeton Wednesday.